ROBERT Halfon, MP for Harlow wrote to Brian Keane, CEO of Harlow Council, and Chief Inspector Matt Cornish at Essex Police to highlight the growing concern with anti-social behaviour in Old Harlow. Robert’s letter comes after a number of residents in Market Street, Old Harlow, have given accounts of verbal and physical abuse, drug dealing and alcohol misuse. They have also shared their concerns relating to breaches of the pubs’ licenses, including blaring music and inadequate numbers of staff manning the doors. Robert Halfon said: “It is simply not right that residents in Market Street have experienced verbal abuse and seen physical fights. Their day-to-day life is being disrupted by anti-social behaviour. After Robert’s calls for Dispersal Orders at peak times, orders were granted over the weekend, allowing police to disperse individuals before tensions escalate. 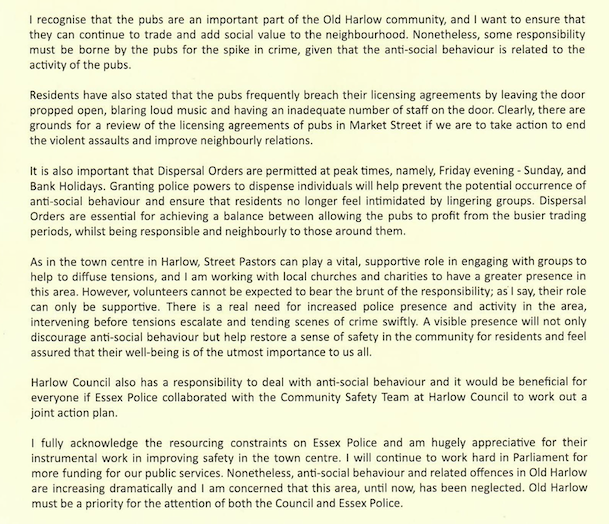 One Response to "Harlow MP writes to council and police over crime and disorder in Old Harlow"
So even Mr Halfon can see what the residents see – a connection with the crimes to the pubs. Try telling that to the council. Repeatedly the council have told residents that no pub is responsible once the drunks have left the premises, nor can they attribute any behaviour to an individual pub because the drunk could’ve come from anywhere..
First point is that the pubs are responsible for their pub and the vicinity of the pub. 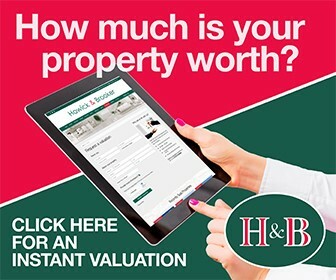 Vicinity means surrounding areas – an area that the council chose themselves. Some councils say 100 yards from the pub, some others say 200 yards. Harlow council seem to give zero yards.. So the fact is here that the council make up the rules and then tell residents they have to abide by the rules. What a load of cobblers. Second point is yes, the drunks could’ve come from any of the pubs – so what do the council do? Refuse police request for CCTV which would pinpoint where people come from and which (if not all) pub is trouble. They could too get off their lazy so-and-so’s and come and witness it for themselves once in a while. There is also something called ‘cumulative Impact of a Concentration of Licenses premises’ which I would say that it was fair that 3 pubs within a few yards comes under. Not according to Harlow Council it’s not. How unfortunate again for residents because an ‘cumulative Impact of a Concentration of Licenses premises’ would mean that it doesn’t matter if crime, disorder and anti-social behaviour came from any of the pubs. Harlow council’s licensing dept is very good at shirking ALL responsibility. They’ve been told about the pubs here for over 5 years.. and even since the recent spate of violence, they still can’t be bothered to come down and see it for themselves. They should be ashamed as they, just like others, have a duty of care.